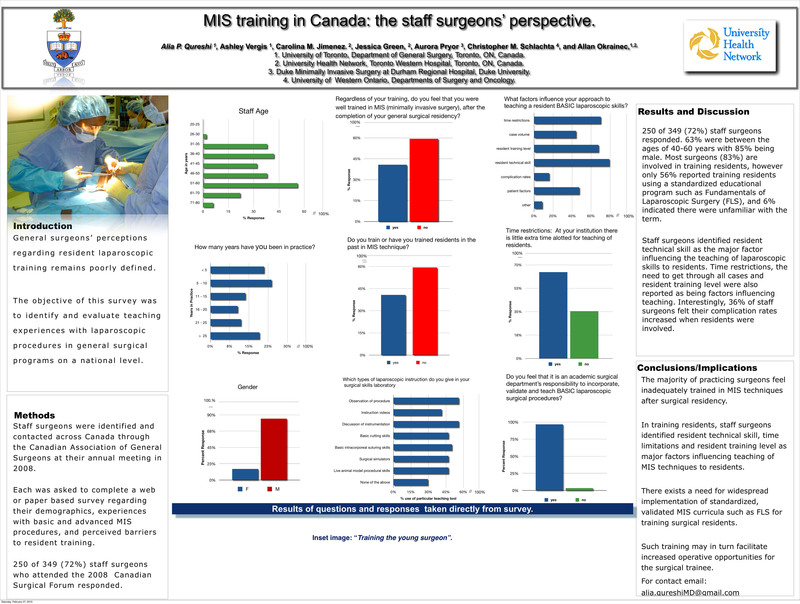 Mis Training in Canada: The Staff Surgeons’ Perspective. Introduction: General surgeons’ perceptions regarding resident laparoscopic training remains poorly defined. The objective of this survey was to identify and evaluate teaching experiences with laparoscopic procedures in general surgical programs on a national level. Methods: Staff surgeons were identified and contacted across Canada through the Canadian Association of General Surgeons at their annual meeting in 2008. Each was asked to complete a web or paper based survey regarding their demographics, experiences with basic and advanced minimally invasive surgery (MIS) procedures, and perceived barriers to resident training. Results: 250 of 349 (72%) staff surgeons who attended the 2008 Canadian Surgical Forum responded. 63% were between the ages of 40-60 years with 85% being male. Although 83% of those surveyed feel they were well trained by their residency program for a generalist practice, 60% feel they were not adequately prepared in MIS techniques. Most surgeons (83%) are involved in training residents, however only 56% reported training residents using a standardized educational program such as Fundamentals of Laparoscopic Surgery (FLS), and 6% indicated there were unfamiliar with the term. Staff surgeons identified resident technical skill as the major factor influencing the teaching of laparoscopic skills to residents. Time restrictions, the need to get through all cases and resident training level were also reported as being factors influencing teaching. Interestingly, 36% of staff surgeons felt their complication rates increased when residents were involved. Greater than 90% respondents also felt that lap colons, spleen, and hernia repairs should be part of general surgery training. More than 97% of staff surgeons felt it was the mandate of the general surgery department to incorporate, validate and teach both basic and advanced MIS techniques. However, 68% of respondents felt this mandate could not be met in their current setting. Finally, 45% of staff felt the MIS fellow has minimal or a positive influence on residency training. Conclusions: The majority of practicing surgeons feel inadequately trained in MIS techniques after surgical residency. In training residents, staff surgeons identified resident technical skill, time limitations and resident training level as major factors influencing teaching of MIS techniques to residents. There exists a need for widespread implementation of standardized, validated MIS curricula such as FLS for training surgical residents. Such training may in turn facilitate increased operative opportunities for the surgical trainee.